The Parliament of Canada (French: Parlement du Canada) is the federal legislature of Canada, seated at Parliament Hill in Ottawa, the national capital. The body consists of the Canadian monarch, represented by a viceroy, the Governor General; an upper house, the Senate; and a lower house, the House of Commons. Each element has its own officers and organization. By constitutional convention, the House of Commons is dominant, with the Senate and monarch rarely opposing its will. The Senate reviews legislation from a less partisan standpoint and the monarch or viceroy provides royal assent to make bills into law. The Governor General summons and appoints the 105 senators on the advice of the Prime Minister, while the 338 members of the House of Commons—called members of parliament (MPs)—each represent an electoral district, commonly referred to as a riding, and are directly elected by Canadian voters. The Governor General also summons Parliament, while either the viceroy or monarch can prorogue or dissolve Parliament, the latter in order to call a general election. Either will read the Throne Speech. The most recent Parliament, summoned by Governor General David Johnston in 2015, is the 42nd since Confederation. The Parliament of Canada is composed of three parts: the monarch, the Senate, and the House of Commons. Each has a distinct role, but work in conjunction within the legislative process. This format was inherited from the United Kingdom and is a near-identical copy of the parliament at Westminster, the greatest differences stemming from situations unique to Canada, such as the impermanent nature of the monarch's residency in the country and the lack of a peerage to form the upper chamber. Only those who sit in the House of Commons are usually called members of parliament (MPs); the term is not usually applied to senators (except in legislation, such as the Parliament of Canada Act), even though the Senate is a part of parliament. Though legislatively less powerful, senators take higher positions in the national order of precedence. No individual may serve in more than one chamber at the same time. The sovereign's place in the legislature, formally called the Queen-in-Parliament, is defined by the Constitution Act, 1867, and various conventions. Neither she nor her viceroy, however, participates in the legislative process, save for signifying the Queen's approval to a bill passed by both houses of parliament, known as the granting of Royal Assent, which is necessary for a bill to be enacted as law. All federal bills thus begin with the phrase "Now, therefore, Her Majesty, by and with the advice and consent of the Senate and House of Commons of Canada, enacts as follows ..." and, as such, the Crown is immune from acts of parliament unless expressed otherwise in the act itself. The governor general will normally perform the task of granting Royal Assent, though the monarch may also do so, at the request of either the Cabinet or the viceroy, who may defer assent to the sovereign as per the constitution. As both the monarch and his or her representatives are traditionally barred from the House of Commons, any parliamentary ceremonies in which they are involved take place in the Senate chamber. The upper and lower houses do, however, each contain a mace, which indicates the authority of the Queen-in-Parliament and the privilege granted to that body by her, both bearing a crown at their apex. The original mace for the Senate was that used in the Legislative Council of the Province of Canada after 1849, while that of the House of Commons was inherited from the Legislative Assembly of the Province of Canada, first used in 1845. Following the burning of the Centre Block on 3 February 1916, the City of London, England, donated a replacement, which is still used today. The temporary mace, made of wood, and used until the new one arrived from the United Kingdom in 1917, is still carried into the Senate each 3 February. The Senate's 1.6-metre-long mace comprises brass and gold. The Senate may not sit if its mace is not in the chamber; it typically sits on the table with the crown facing the throne, though it may, during certain ceremonies, be held by the Mace Bearer, standing adjacent to the governor general or monarch in the Senate. Members of the two houses of parliament must also express their loyalty to the sovereign and defer to her authority, as the Oath of Allegiance must be sworn by all new parliamentarians before they may take their seats. Further, the official opposition is formally called Her Majesty's Loyal Opposition, to signify that, though they may be opposed to the incumbent Cabinet's policies, they remain dedicated to the apolitical Crown. The upper house of the Parliament of Canada, the Senate (French: Sénat), is a group of 105 individuals appointed by the governor general on the advice of the prime minister; all those appointed must, per the constitution, be a minimum of 30 years old, be a subject of the monarch, and own property with a net worth of at least $4,000, in addition to owning land worth no less than $4,000 within the province he or she is to represent. Senators served for life until 1965, when a constitutional amendment imposed a mandatory retirement age of 75. Senators may, however, resign their seats prior to that mark, and can lose their position should they fail to attend two consecutive sessions of parliament. The Senate is divided equally amongst four geographic regions: 24 for Ontario, 24 for Quebec, 24 for the Maritimes (10 for Nova Scotia, 10 for New Brunswick, and four for Prince Edward Island), and 24 for the Western provinces (six each for Manitoba, British Columbia, Saskatchewan, and Alberta). Newfoundland and Labrador, which became a Canadian province in 1949, is represented by six senators, and is not part of a senatorial division. Further, Canada's three territories—the Northwest Territories, Yukon, and Nunavut—are allocated one senator each. An additional four or eight senators may be temporarily appointed by the governor general, provided the approval of the Queen is secured, and the four divisions are equally represented, putting the maximum number of senators at 113. This power has been employed once since 1867: to ensure the passage of the bill establishing the Goods and Services Tax, with Prime Minister Brian Mulroney advising Queen Elizabeth II to appoint extra senators in 1990. The elected component of the Canadian Parliament is the House of Commons (French: Chambre des communes), with each member chosen by a plurality of voters in each of the country's federal electoral districts, or ridings. To run for one of the 338 seats in the lower house, an individual must be at least 18 years old. Each member holds office until Parliament is dissolved, after which they may seek re-election. The ridings are regularly reorganized according to the results of each decennial national census; however, the "senatorial clause" of the Constitution Act, 1867 guarantees each province at least as many MPs as it has senators, and the "grandfather clause" permits each province as many MPs as it had in either 1976 or 1985. The existence of this legislation has pushed the size of the House of Commons above the required minimum of 282 seats. The powers of the Parliament of Canada are limited by the constitution, which divides legislative abilities between the federal and provincial legislatures; in general, provincial legislatures may only pass laws relating to topics explicitly reserved for them by the constitution (such as education, provincial officers, municipal government, charitable institutions, and "matters of a merely local or private nature",) while any matter not under the exclusive authority of the provincial legislatures is within the scope of the federal parliament's power. Thus, parliament alone can pass laws relating to, among other things, the postal service, census, military, navigation and shipping, fishing, currency, banking, weights and measures, bankruptcy, copyrights, patents, First Nations, and naturalization. In some cases, however, the jurisdictions of the federal and provincial parliaments may be more vague. For instance, the parliament in Ottawa regulates marriage and divorce in general, but the solemnization of marriage is regulated only by the provincial legislatures. Other examples include the powers of both the federal and provincial parliaments to impose taxes, borrow money, punish crimes, and regulate agriculture. The powers of parliament are also limited by the Canadian Charter of Rights and Freedoms, though most of its provisions can be overridden by use of the notwithstanding clause. Such clause, however, has never been used by the federal parliament, though it has been employed by some provincial legislatures. Laws violating any part of the constitution are invalid and may be ruled unconstitutional by the courts. Each of the parliament's two chambers is presided over by a speaker; that for the Senate is a member of that house appointed by the governor general, as advised by the prime minister, while the equivalent for the House of Commons is a member of parliament elected by the other members of that body. In general, the powers of the latter are greater than those of the former; following the British model, the upper chamber is essentially self-regulating, whereas the lower chamber is controlled from the chair. In 1991, however, the powers of the Speaker of the Senate were expanded, moving the position closer to that in the Commons. The Usher of the Black Rod of the Senate of Canada is the most senior protocol position in parliament, being the personal messenger to the legislature of the sovereign and governor general. He or she is also a floor officer of the Senate responsible for security in that chamber, as well as for protocol, administrative, and logistical details of important events taking place on Parliament Hill, such as the Speech from the Throne, Royal Assent ceremonies, state funerals, or the investiture of a new governor general. Other officers of parliament include the Auditor General, Chief Electoral Officer, Official Languages Commissioner, Privacy Commissioner, Access to Information Commissioner, Conflict of Interest and Ethics Commissioner, Public Sector Integrity Commissioner, and Commissioner of Lobbying. These individuals are appointed by either one or both houses, to which they report through the speaker of that house. They are sometimes referred to as Agents of Parliament. Another key official is the Parliamentary Librarian, a position established in 1871 under the Library of Parliament Act, charged with running the Library of Parliament. The Constitution Act, 1867, outlines that the governor general alone is responsible for summoning parliament, though it remains the monarch's prerogative to prorogue and dissolve the legislature, after which the writs for a general federal election are usually dropped by the governor general at Rideau Hall. Upon completion of the election, the viceroy, on the advice of his or her prime minister, then issues a royal proclamation summoning parliament to assemble. On the date given, new MPs are sworn-in and then are, along with returning MPs, called to the Senate, where they are instructed to elect their speaker and return to the House of Commons to do so before adjourning. The new parliamentary session is marked by the opening of parliament, during which either the monarch, the governor general, or a royal delegate,[n 1] reads the Speech From the Throne. MPs receive the Royal Summons to these events from the Usher of the Black Rod after he knocks on the doors of the lower house that have been slammed shut, to illustrate the Commons' right to deny entry to anyone, including the monarch, but excepting royal messengers. Once MPs are gathered behind the Bar of the Senate—save for the prime minister, the only MP permitted into the Senate proper to sit near the throne dais—the speaker of the lower house presents him or herself to the monarch or governor general and formally claims the rights and privileges of the House of Commons, to which the Speaker of the Senate, on behalf of the Crown, replies in acknowledgement after the sovereign or viceroy takes their seat on the throne. The speech is then read, outlining the programme of the Cabinet for the upcoming legislative session. 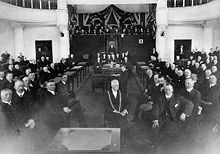 A parliamentary session lasts until a prorogation, after which, without ceremony, both chambers of the legislature cease all legislative business until the governor general issues another proclamation calling for a new session to begin; except for the election of a speaker for the House of Commons and his or her claiming of that house's privileges, the same procedures for the opening of parliament are again followed. After a number of such sessions—having ranged from one to seven—a parliament comes to an end via dissolution, and a general election typically follows. Subject to the governor general's discretion, general elections are held four years after the previous on the third Monday in October or, on the recommendation of the chief electoral officer, the following Tuesday or Monday. The governor general may dissolve parliament and call a general election outside of these fixed dates, conventionally on the advice of the prime minister, which may be preceded by a successful motion of no confidence. The timing of such dissolutions may be politically motivated. Both houses determine motions by voice vote; the presiding officer puts the question and, after listening to shouts of "yea" and "nay" from the members, announces which side is victorious. This decision by the Speaker is final, unless a recorded vote is demanded by members—at least two in the Senate and five in the House of Commons. Members of both houses vote by rising in their places to be counted; the Speaker of the Senate is permitted to vote on a motion or bill—though does so irregularly, in the interest of impartiality—and, if there is no majority, the motion is defeated. In the Commons, however, the Speaker cannot vote, unless to break a tie, at which time he or she will customarily vote in favour of the status quo. The constitution establishes the quorums to be 15 senators in the upper house and 20 members in the lower house, the Speaker of each body being counted within the tally. Voting can thus take three possible forms: whenever possible, leaving the matter open for future consideration and allowing for further discussion by the house; when no further discussion is possible, taking into account that the matter could somehow be brought back in future and be decided by a majority in the house; or, leaving a bill in its existing form rather than having it amended. For example, during the vote on the 2005 budget, which was considered a vote of confidence, the Speaker of the House of Commons cast the tie-breaking vote during the second reading, moving in favour of the budget and allowing its passage. If the vote on the third reading had again been tied, the speaker would have been expected to vote against the bill, bringing down the government. Simultaneous interpretation for both official languages, English and French, is provided at all times during sessions of both houses. Laws, known in their draft form as bills, may be introduced by any member of either house. However, most bills originate in the House of Commons, of which most are put forward by ministers of the Crown, making them government bills, as opposed to private members' bills or private senators' bills, which are launched by MPs and senators, respectively, who are not in cabinet. Draft legislation may also be categorised as public bills, if they apply to the general public, or private bills, if they concern a particular person or limited group of people. Each bill then goes through a series of stages in each chamber, beginning with the first reading. It is not, however, until the bill's second reading that the general principles of the proposed law are debated; though rejection is a possibility, such is not common for government bills. Next, the bill is sent by the house where it is being debated to one of several committees. The Standing Orders outline the general mandate for all committees, allowing them to review: bills as they pertain to relevant departments; the program and policy plans, as well as the projected expenditures, and the effectiveness of the implementation thereof, for the same departments; and the analysis of the performance of those departments. Most often, bills end up before a standing committee, which is a body of members or senators who specialise in a particular subject (such as foreign affairs), and who may hear testimony from ministers and experts, debate the bill, and recommend amendments. The bill may also be committed to the Committee of the Whole, a body consisting of, as the name suggests, all the members of the chamber in question. Finally, the bill could be referred to an ad hoc committee established solely to review the piece of legislation in question. Each chamber has their own procedure for dealing with this, with the Senate establishing special committees that function like most other committees, and the House of Commons establishing legislative committees, the chair of the latter being appointed by the speaker of the House of Commons, and is normally one of his deputies. Whichever committee is used, any amendments proposed by the committee are considered by the whole house in the report stage. Furthermore, additional amendments not proposed by the committee may also be made. After the report stage (or, if the committee made no amendments to the bill, immediately after the committee stage), the final phase of the bill—the third reading—occurs, at which time further amendments are not permitted in the House of Commons, but are allowed in the Senate. If one house passes amendments that the other will not agree to, and the two houses cannot resolve their disagreements, the bill fails. If, however, it passes the third reading, the bill is sent to the other house of parliament, where it passes through the same stages; amendments made by the second chamber require the assent of the original house in order to stand part of the final bill. Once the bill is passed in identical form by both houses, it is presented for Royal Assent; in theory, the governor general has three options: he or she may grant Royal Assent, thereby making the bill into law; withhold Royal Assent, thereby vetoing the bill; or reserve the bill for the signification of the Queen's pleasure, which allows the sovereign to personally grant or withhold assent. If the governor general does grant Royal Assent, the monarch may, within two years, disallow the bill, thus annulling the law in question. In the federal sphere, no bill has ever been denied royal approval. In conformity with the British model, only the House of Commons may originate bills for the imposition of taxes or for the appropriation of Crown funds. Otherwise, the theoretical power of both houses over bills is equal, with the assent of each being required for passage. In practice, however, the House of Commons is dominant, with the Senate rarely exercising its powers in a way that opposes the will of the democratically elected house. The Canadian government consists of the monarch, predominantly represented by his or her governor general, in council, which is a collection of ministers of the Crown appointed by the governor general to direct the use of executive powers. Per the tenets of responsible government, these individuals are almost always drawn from parliament, and are predominantly from the House of Commons, the only body to which ministers are held accountable, typically during Question Period, wherein ministers are obliged to answer questions posed by members of the opposition. Hence, the person who can command the confidence of the lower chamber—usually the leader of the party with the most seats therein—is typically appointed as prime minister. Should that person not hold a seat in the House of Commons, he or she will, by convention, seek election to one at the earliest possible opportunity; frequently, in such situations, a junior Member of Parliament who holds a safe seat will resign to allow the prime minister to run for that riding in a by-election. If no party holds a majority, it is customary for the governor general to summon a minority government or coalition government, depending on which the commons will support. The lower house may attempt to bring down the government by either rejecting a motion of confidence—generally initiated by a minister to reinforce the Cabinet's support in the commons—or by passing a motion of no confidence—introduced by the opposition to display its distrust of the Cabinet. Important bills that form part of the government's agenda will usually be considered matters of confidence; the budget is always a matter of confidence. Where a government has lost the confidence of the House of Commons, the prime minister is obliged to either resign (allowing the governor general to appoint the Leader of the Opposition to the office) or seek the dissolution of parliament and the call of a general election. A precedent, however, was set in 1968, when the government of Lester B. Pearson unexpectedly lost a confidence vote but was allowed to remain in power with the mutual consent of the leaders of the other parties. In practice, the House of Commons' scrutiny of the government is quite weak in comparison to the equivalent chamber in other countries using the Westminster system. With the plurality voting system used in parliamentary elections tending to provide the governing party with a large majority and a party system that gives leaders strict control over their caucus (to the point that MPs may be expelled from their parties for voting against the instructions of party leaders), there is often limited need to compromise with other parties. Additionally, Canada has fewer MPs, a higher turnover rate of MPs after each election, and an Americanised system for selecting political party leaders, leaving them accountable to the party membership rather than caucus, as is the case in the United Kingdom; John Robson of the National Post opined that Canada's parliament had become a body akin to the American Electoral College, "its sole and ceremonial role to confirm the executive in power." At the end of the 20th century and into the 21st, analysts—such as Jeffrey Simpson, Donald Savoie, and John Gomery—argued that both parliament and the Cabinet had become eclipsed by prime ministerial power. Thus, defeats of majority governments on issues of confidence are very rare. In contrast, a minority government is more volatile, and is more likely to fall due to loss of confidence. The last prime ministers to lose confidence votes were Stephen Harper in 2011, Paul Martin in 2005 and Joe Clark in 1979, all involving minority governments. Parliament possesses a number of privileges, collectively and accordingly known as parliamentary privilege, each house being the guardian and administrator of its own set of rights. Parliament itself determines the extent of parliamentary privilege, each house overseeing its own affairs, but the constitution bars it from conferring any "exceeding those at the passing of such an Act held, enjoyed, and exercised by the [British House of] Commons... and by the Members thereof." The foremost dispensation held by both houses of Parliament is that of freedom of speech in debate; nothing said within the chambers may be questioned by any court or other institution outside of Parliament. In particular, a member of either house cannot be sued for slander based on words uttered in the course of parliamentary proceedings, the only restraint on debate being set by the standing orders of each house. Further, MPs and senators are immune to arrest in civil (but not criminal) cases, from jury service and attendance in courts as witnesses. They may, however, be disciplined by their colleagues for breach of the rules, including contempt of parliament—disobedience of its authority; for example, giving false testimony before a parliamentary committee—and breaches of its own privileges. 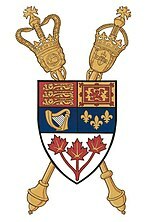 The Canadian Heraldic Authority, on 15 April 2008, granted the Parliament of Canada, as an institution, a heraldic achievement composed of symbols of the three elements of parliament: the escutcheon of the Royal Arms of Canada (representing the Queen) with the maces of the House of Commons and Senate crossed behind. The budget for the Parliament of Canada for the 2010 fiscal year was $583,567,000. Following the cession of New France to the United Kingdom in the 1763 Treaty of Paris, Canada was governed according to the Royal Proclamation issued by King George III in that same year. To this was added the Quebec Act, by which the power to make ordinances was granted to a governor-in-council, both the governor and council being appointed by the British monarch in Westminster, on the advice of his or her ministers there. In 1791, the Province of Quebec was divided into Upper and Lower Canada, each with an elected legislative assembly, an appointed legislative council, and a governor, mirroring the parliamentary structure in Britain. During the War of 1812, American troops set fire to the buildings of the Legislative Assembly of Upper Canada in York (now Toronto). In 1841, the British government united the two Canadas into the Province of Canada, with a single legislature composed of, again, an assembly, council, and governor general; the 84 members of the lower chamber were equally divided among the two former provinces, though Lower Canada had a higher population. The governor still held significant personal influence over Canadian affairs until 1848, when responsible government was implemented in Canada. The actual site of parliament shifted on a regular basis: From 1841 to 1844, it sat in Kingston, where the present Kingston General Hospital now stands; from 1844 until the 1849 fire that destroyed the building, the legislature was in Montreal; and, after a few years of alternating between Toronto and Quebec City, the legislature was finally moved to Ottawa in 1856, Queen Victoria having chosen that city as Canada's capital in 1857. The modern-day Parliament of Canada came into existence in 1867, in which year the Parliament of the United Kingdom of Great Britain and Ireland passed the British North America Act, 1867, uniting the provinces of New Brunswick, Nova Scotia, and Canada—with the Province of Canada split into Quebec and Ontario—into a single federation called the Dominion of Canada. Though the form of the new federal legislature was again nearly identical to the parliament of the United Kingdom, the decision to retain this model was made with heavy influence from the just-concluded American Civil War, which indicated to many Canadians the faults of the American federal system, with its relatively powerful states and a less powerful federal government. The British North America Act limited the powers of the provinces, providing that all subjects not explicitly delegated to them by that document remain within the authority of the federal parliament, while simultaneously giving the provinces unique powers in certain agreed-upon areas of funding. Full legislative autonomy was granted by the Statute of Westminster, 1931, passed by the Parliament of the United Kingdom. Though the statute allowed the Parliament of Canada to repeal or amend previously British laws as they applied to Canada, it did not permit the amendment of Canada's constitution, including the British North America Acts. Hence, whenever a constitutional amendment was sought by the Canadian parliament, the enactment of a British law became necessary, though Canada's consent was required. The Parliament of Canada was granted limited power to amend the constitution by a British Act of Parliament in 1949, but it was not permitted to affect the powers of provincial governments, the official positions of the English and French languages, rights of any class of persons with respect to schools, or the maximum five-year term of the legislature. The Canadian House of Commons and Senate last requested the Parliament of the United Kingdom to enact a constitutional amendment in 1982, in the form of the Canada Act, which included the Constitution Act, 1982. This legislation terminated the power of the British parliament's ability to legislate for Canada and the authority to amend the constitution was transferred to the Canadian House of Commons, the Senate, and the provincial legislative assemblies, acting jointly. Most amendments require the consent of the Senate, the House of Commons, and the legislative assemblies of two-thirds of the provinces representing a majority of the population; the unanimous consent of provincial legislative assemblies is required for certain amendments, including those affecting the sovereign, the governor general, the provincial lieutenant governors, the official status of the English and French languages, the Supreme Court of Canada, and the amending formulas themselves. ^ On 1 September 1919, Edward, Prince of Wales (later King Edward VIII) read the Speech From the Throne at the opening of the third session of the 13th Canadian Parliament. ^ a b Liberal MPs and senators sit in separate caucuses. ^ Victoria (29 March 1867). Written at IV.55. "Constitution Act, 1867". Westminster: Queen's Printer. ^ "Symbols Gallery". Library of Parliament. Retrieved 15 June 2017. ^ McDonough, John (1979). "The Maces of the Canadian Provincial and Territorial Legislatures (I)" (PDF). Canadian Regional Review. Ottawa: Commonwealth Parliamentary Association. 2 (4): 36. ISSN 0707-0837. Retrieved 19 October 2009. ^ Library of Parliament. "About Parliament > Education > Classroom Resources > Canadian Symbols at Parliament > Parliament Hill Symbols > Mace (House of Commons)". Queen's Printer for Parliament. Archived from the original on 12 October 2012. Retrieved 19 October 2009. ^ Marleau, Robert; Montpetit, Camille (2000). House of Commons Procedure and Practice. Ottawa: Queen's Printer for Canada. ISBN 2-89461-378-4. 1. Parliamentary Institutions > Institutional Framework > The Opposition. ^ Victoria (29 March 1867). Written at IV.24. "Constitution Act, 1867". Westminster: Queen's Printer. ^ Victoria (29 March 1867). Written at IV.23. "Constitution Act, 1867". Westminster: Queen's Printer. ^ Victoria (29 March 1867). Written at IV.22. "Constitution Act, 1867". Westminster: Queen's Printer. ^ Victoria (29 March 1867). Written at IV.21A. "Constitution Act, 1867". Westminster: Queen's Printer. ^ Victoria (29 March 1867). Written at VI.92. "Constitution Act, 1867". Westminster: Queen's Printer. ^ Victoria (29 March 1867). Written at VI.91. "Constitution Act, 1867". Westminster: Queen's Printer. ^ Library of Parliament. "Usher of the Black Rod in the Senate". Queen's Printer for Canada. Archived from the original on 16 August 2009. Retrieved 19 October 2009. ^ Elizabeth II (12 January 2008). "Notice of Vacancy, Usher of the Black Rod" (PDF). Canada Gazette. Ottawa: Queen's Printer for Canada. 142 (2): 74. Retrieved 26 January 2009. ^ "Officers and Officials of Parliament". Queen's Printer for Canada. Retrieved 27 May 2011. ^ Government of Canada. "Speech From the Throne > Frequently Asked Questions". Queen's Printer for Canada. Archived from the original on 9 March 2010. Retrieved 4 June 2010. ^ Royal Household. "Royal events and ceremonies > State Opening of Parliament". Queen's Printer. Retrieved 13 October 2012. ^ "Canada Elections Act". Justice Laws Website. Part 5. Retrieved 17 July 2017. ^ "Dissolution of Parliament - Compendium of Procedure - House of Commons". Retrieved 18 July 2017. ^ Parliament of Canada. "House of Commons Procedure and Practice > 20. Committees > Types of Committees and Mandates". Queen's Printer for Canada. Retrieved 6 February 2011. ^ Brooks, Stephen (2007). Canadian Democracy: An Introduction (5 ed.). Don Mills: Oxford University Press. p. 258. ISBN 978-0-19-543103-2. ^ Victoria (29 March 1867). Written at IV.18. "Constitution Act, 1867". Westminster: Queen's Printer. ^ Canadian Heraldic Authority. "Public Register of Arms, Flags and Badges of Canada > Parliament of Canada". Queen's Printer for Canada. Retrieved 8 August 2010. ^ Vongdougngchanh, Bea (8 March 2010). "Parliament's budget boosted to $583,567,000 this year". The Hill Times. Ottawa. Archived from the original on 5 January 2011. Retrieved 6 January 2011. House of Commons Table Research Branch. (2005). Précis of Procedure.